A stratified flow is produced by a fluid which density varies with position and/or time.The buoyancy force at a given position will depend on the difference of density between the fluid and its local environment. When perturbed, a stratified system will produce internal waves and overturning, which contribute to the mixing of the fluid. Turbulent mixing in the ocean interior plays a crucial role in its global energy budget and therefore in the climate. This mixing partially drives large scale dynamics, and is evidenced in the meridional overturning circulation. In addition, vertical transport in the ocean is substantial for sequestering large quantities of dissolved greenhouse gases from the atmosphere to the deep ocean. The proportion of energy transferred from turbulent structures to effective mixing is very difficult to estimate through observations, and the details of this energy transfer is yet not fully understood. 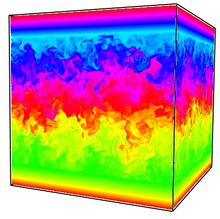 In order to acknowledge this question we performed Direct Numerical Simulations of a linearly stratified bounded fluid in decaying turbulence. The absence of vertical periodicity allows the stratification of the system to evolve in time. We observe that mixing efficiency increases as a function of the Richardson number Ri, and saturates to a maximum value of 0.25. This evolution adjusts quantitatively to a recent statistical prediction of Venaille et al. (2016).